Strengths: Semin has an abundance of raw talent that often leaves opposing goalies and defensemen, as well as his own teammates in awe. Semin consistently shows that not only is he an elite clutch scorer but also is reliable in defensive situations. Weaknesses: Whether in the NHL or in international competition, Semin can be prone to playing less competitively when not given a primary role on the team. At times, his undisciplined play leads to costly penalties. 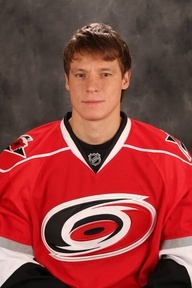 Biography: Alexander Semin was born in Krasnoyarsk, Siberia and was interested in hockey from his early childhood. He developed with the Traktor Chelyabinsk organization and graduated to the main team in 2001. That season he received plenty of NHL attention and in the end was drafted by the Washington Capitals. After one year with the competitive Lada team in the Russian Superleague, Semin made the jump to the NHL in 2003. The Capitals were in rebuilding mode and Semin was one of the club’s few bright spots. During the NHL lockout of 2004-05, Alexander returned to Lada instead of spending the year with Washington’s farm team. This contradicted Washington’s plans for Semin, which got him suspended by the Capitals for that season. With NHL play resuming in 2005, Semin did not return to the Capitals because of continued military service obligations in Russia, meaning that he had to play one more year with Lada. The ensuing turn of events led to legal problems. First, the Capitals filed a complaint against Semin and his agent. Then, when Lada became mired in financial difficulty and could not pay Semin’s salary, Alexander sued for a transfer to another club. He finished the season with Khimik and afterwards returned to the Capitals. The 2006-07 season saw “Sema” produce at nearly a point-per-game rate. He found immediate chemistry playing with Washington’s other Alex, Ovechkin. The two are also good friends off the ice and hang out together during their NHL travels and during the off-season in Russia. According to teammates, Semin and Ovechkin’s are the “class clowns” of the Capitals, constantly pulling practical jokes. A streak of injuries and bad luck caused Semin to miss nearly 50 games in the next three seasons, but the additions of veterans Sergei Fedorov and Viktor Kozlov to the club influenced him to improve his defensive game and be a more complete hockey player. With Caps teammates Ovechkin and Fedorov, Alexander was part of Russia’s dynamic first line that led the way to a gold medal at the 2008 World Championship in Quebec. Semin scored two goals in the final and was named the best player of the tournament. In international play, Semin was part of Russia’s teams that won silver at the 2002 Under-18 World Championship, bronze at the 2005 Worlds, silver at the 2010 Worlds, and gold at the 2012 World Championship. Semin was controversially taken off Russia’s roster for not arriving on time for the start of training camp in Moscow before the 2007 WC. Both Semin and Russia’s coach Slava Bykov laughed the matter off later, citing miscommunication as the cause for the incident. “Sema” is not a vocal leader on his team and rarely gives English-language interviews, but he did find himself in another controversy for being honest and saying that the NHL gives too much attention to a few stars like Crosby over many other talented players. 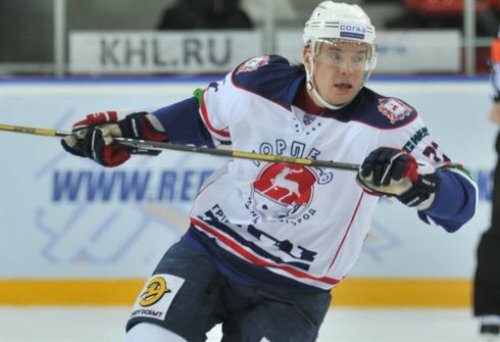 At the beginning of the 2012-13 NHL lockout, Semin agreed to play for minimal salary for his hometome club, Sokol Krasnoyarsk in Russia’s second league. After a few games with Sokol, he joined the KHL’s Torpedo in Nizhniy Novgorod. He made his return to the NHL as a member of the Carolina Hurricanes, with who he signed a five-year contract.